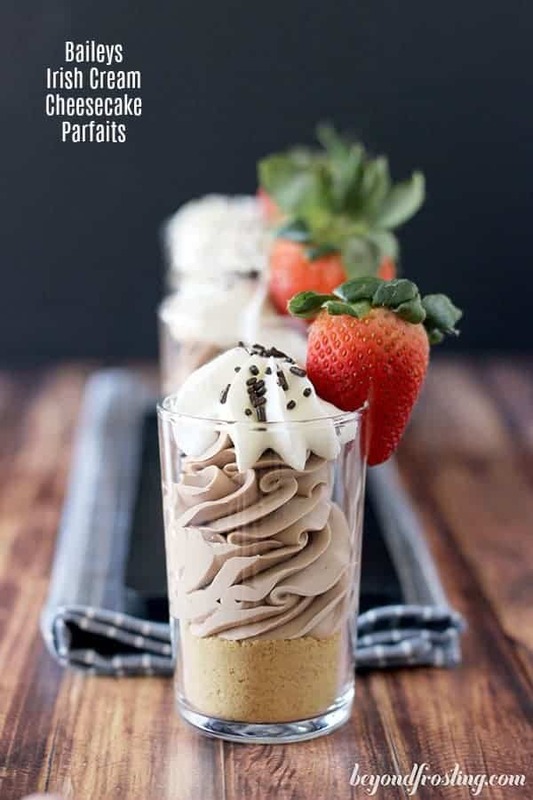 These Baileys Irish Cream Cheesecake Parfaits are made with a Baileys infused chocolate, and mixed with cream cheese and whipped cream. The texture is perfectly light and airy for this no-bake cheesecake! A whole week of Baileys desserts and we’re saving the best for last. 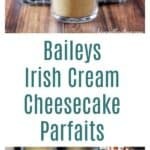 I can’t remember what exactly inspired me to make all my recipes for this week with Baileys Irish Cream, but high fives for coming up with that idea. Am I right? HELLOOO, cheesecake is my jam especially if it’s a no-bake cheesecake. 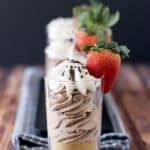 The idea for these shooters came from my No-Bake Whiskey Spiked Chocolate Parfaits, do you notice a trend here?. I loved it so much that I even made this recipe into a 9-inch No-Bake Baileys Cheesecake, incase you wanted to serve a larger crowd. 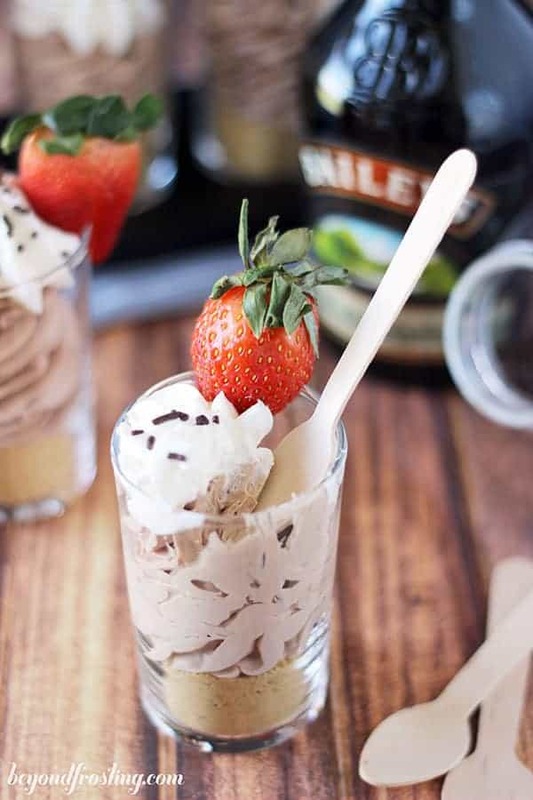 This mousse is made with a Baileys infused chocolate. This is the type of dessert that requires a really good quality chocolate. Some of the options are Ghirardelli Chocolate Bars or Callebaut Callets– which are seriously amazing. The chocolate is melted with some heavy whipping cream, and then the Baileys Irish Cream is added. It is best to allow this to cool prior to adding it to the cream cheese. You have two options for the filling. You can use Cool Whip or homemade whipped cream. Personally, I prefer homemade whipped cream. It’s an extra step, but it’s worth it. I find this generally helps makes the mousse even more light and airy. You can use any type of cookie for the “crust” of these parfaits. I choose graham cracker just because it’s my favorite crust with have with a cheesecake, but Oreos would also be really good. The cookie crumbs are mixed with a little bit of butter to help hold it together. I also topped these parfaits with a little bit of homemade whipped cream and a strawberry. 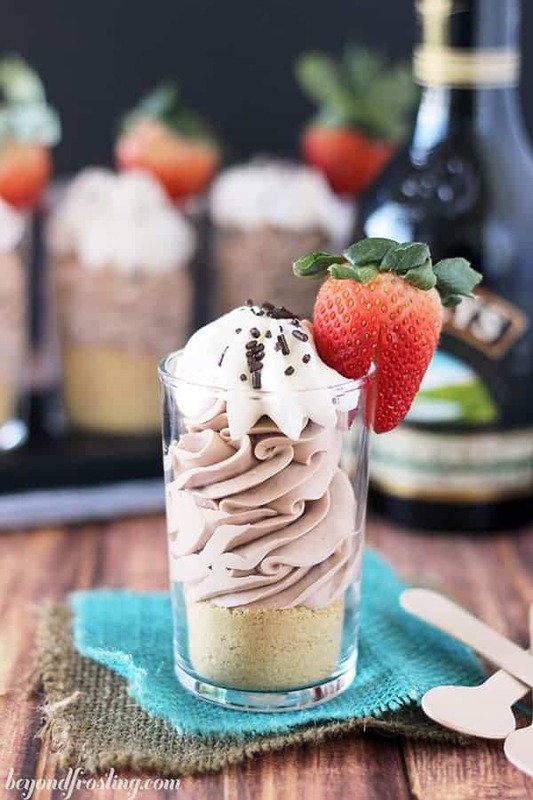 You don’t have to wait for St. Paddy’s Day for these Bailey Irish Cream Cheesecake Parfaits. I give you permission to enjoy them year-round. 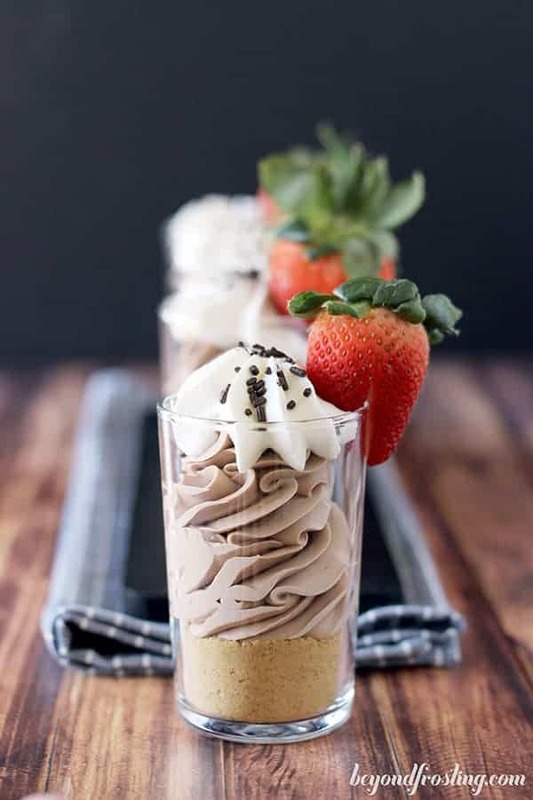 These Baileys Irish Cream Cheesecake Parfaits are made with a Baileys infused chocolate, and mixed with cream cheese and whipped cream. 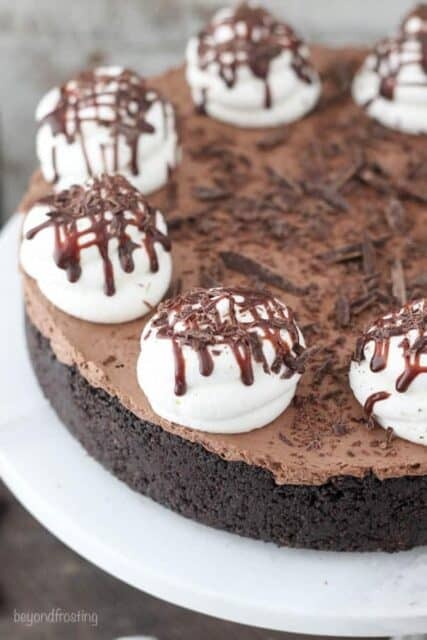 The texture is perfectly light and airy for this no-bake cheesecake!. In a microwave-safe bowl, combine the dark chocolate chips and 3 tablespoons of heavy whipping cream. Heat in the microwave in seconds increments, stirring occasionally until the chocolate starts to melt. Whisk until smooth. Next, add the Baileys Irish Cream and whisk into melted chocolate. Allow the chocolate to cool for 15 minutes. Prepare the whipped cream. Pour 1 ¼ cups heavy whipping cream into the chilled bowl. Use an electric mixer to beat the cream on medium-high speed until the cream starts to thicken. Slowly add the powdered sugar and continue beating on high speed until stiff peaks form. Set the whipped cream aside. Beat the cream cheese until smooth, scraping the bowl occasionally. Next, add the melted chocolate and continue beating until combined. Slowly fold in the whipped cream in two batches until it’s completely smooth. Pour the filling into a large pipe bag fitted with a large open star tip. Use a food processor to grind the graham crackers into a fine crumb. In a microwave-safe bowl, melt butter for about 30 seconds. Combine the melted butter with graham cracker crumbs and mix thoroughly. Prepare a second batch of whipped cream to top these parfaits with. Wash, dry strawberries. Slice down the middle, halfway, and slide on the edge of the glass. Assemble your parfaits by adding one-two teaspoons of the graham cracker crumbs into the bottom of your parfaits. Follow with about 1/4 cup of the chocolate filling and top with whipped cream. Garnish with strawberries. 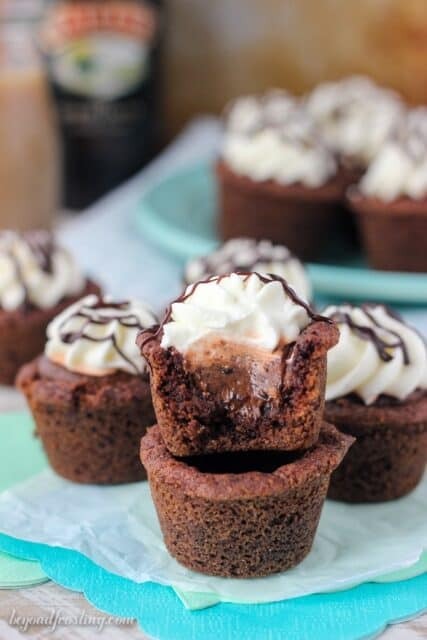 Could I make these one day in advance, and then top with whipped cream before serving? Thanks! Hi Wendy- yes that will be fine! Just store them covered in the refrigerator! I love reality tv shows as well. It is so bad. Speaking of this dessert i love love baileys and this dessert is amazing. Pinned ! !